An Edo iroko performed at the Moritaza in the 11th lunar month of 1744. No record afterwards. Born in 1743. Disciple of Nakamura Kumetarô I, he started his career in Kamigata at the end of the 1750s, performing under the name of Nakamura Inosuke. He became tachiyaku and took the name of Nakamura Kichijûrô I in the 11th lunar month of 1762. Later, he switched to katakiyaku roles. He played in Kyôto in the 11th lunar month of 1768 the role of Iwagami Hyôta in the kaomise drama "Enmusubi Asahi no Shimadai", sharing the same stage with his master in a drama which was produced by Onoe Kumesuke. This was his last kaomise for he died in Kyôto the 19th day of the 10th lunar month of 1769. The name of Nakamura Kichijûrô was held by a minor actor in Kamigata during the Meiwa era, at the end of the 1760s and the beginning of the 1770s. Dates of birth and death unknown. 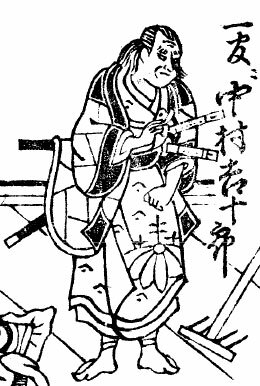 Younger brother of Nakamura Kichijûrô I, his first stage name was Nakamura Kichizô IV, which he received in the 11th lunar month of 1766 at the Naka no Shibai, where he performed as an iroko. He took the name of Nakamura Kichijûrô II in the 11th lunar month of 1776 in Kyôto, performing in the kaomise drama "Saiwai Gura Manpô no Irifune", which was produced by Ogurayama Toyosaki at Hoteiya Umenojô's theater and also celebrated the shûmei of Nakamura Kyôjûrô II. He took the name of Nakamura Shirohachi in the 1st lunar month of 1785 and switched back to Nakamura Kichijûrô II in the 11th lunar month of 1787. Then, he changed to Nakamura Kichizô IV in the 1st lunar month of 1788. He finally took back the name of Nakamura Kichijûrô II in the 11th lunar month of 1791 in Kyôto at the Nishi no Shibai, where he played the role of Nekomata in the kaomise drama "Hakubai Genji Shugi no Hajime", which was produced by Anegawa Kumajirô.No record afterwards. He was a supporting katakiuchi actor. A koyaku actor held the name of Nakamura Kichijûrô in 1832 and 1833. No record afterwards. Born the 29th of July 1885. Son of Ichikawa Takisaburô, he started his career in kodomo shibai but we did not find any record for his youth career. He became a disciple of Nakamura Kichiemon I at the end of the 1880s and received the name of Nakamura Kichijûrô I. He joined the cinema world in 1917 and was active up to the end of 1937. No record afterwards. Unknown day of death. Born the 12th of December 1907. Son of Nakamura Kichijûrô I and disciple of Nakamura Kichiemon I, he made his first stage appearance (hatsubutai) in January 1922 at the Shintomiza, where he received the name of Nakamura Kichisa II. He became nadai and took the name of Nakamura Kichibê II in May 1935 at the Meijiza. This name was not held for 170 years! He finally took the name of Nakamura Kichijûrô II in November 1945 at the Tôkyô Gekijô. In 1961, following Matsumoto Kôshirô VIII and others actors, he left the Shôchiku Company to sign an exclusive contract with the Tôhô Company. The Tôhô Kabuki troupe lasted 11 years and Kichijûrô went back to the Shôchiku Company in 1972. He appeared on stage for the last time in September 1976, in Tôkyô at the Imperial Theater, where he played the role of Taira no Kunika in the drama "Kaze to Kumo to Niji to". One of the two veterans of Nakamura Kichiemon I's troupe, along with Nakamura Kichinojô I, he was nicknamed the young bantô (Wakabantô in Japanese) as he also excelled in bantô roles, just like Nakamura Kichinojô I who was nicknamed the grand bantô (Ôbantô in Japanese). He was also a living memory for Nakamura Kichiemon I's kata and helped transmitting them. He died the 5th of October 1977.